Just before February vacation, Atrium held its Freedom & Justice Assembly, which celebrates the efforts of the heroes who fight for social justice and equality around the world through song and poetry. PreK–3rd grade began the assembly by singing "If I Had a Hammer," followed by the 2nd grade's readings of their thoughts on what it means to be human. Marshall welcomed visitors by reading "The Seedling" by Paul Laurence Dunbar, which exhorts its readers to "be like the seedling,/ Always do the best you can;/Every child must share life's labor/Just as well as every man." 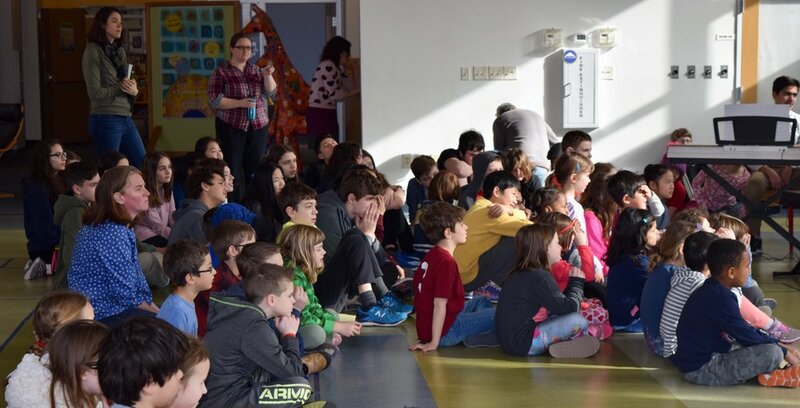 Fourth and fifth graders sang "Lo Yisa Goy," a Hebrew folk song, which loosely translates as: "A nation shall raise/ A sword against a nation/ And they shall not learn/ Any more war." Members of Atrium's Anti-Bias and Equity (ABE) Committee read two poems: "Midway" by Naomi Long Madgett, and "People Equal" by James Berry. Violinists from the 4th and 6th grade played "The Snowy Path," and seventh and 8th grade violinists played "All We Have," written by Atrium's own violin teacher, Christine Hedden. The 8th grade and Atrium's drama teacher Sophie Rich presented the lessons they learned from their Social Justice cluster, before the Assembly concluded with the Middle School Chorus' rousing rendition of "La Vida es un Carnaval."